Sisters Doha Ibrahim Abeyat (left) and Hind Ibrahim Abeyet hold a framed photo of their father, Ibrahim Abeyet, who was deported from the West Bank to Italy in 2002. Credit: Jillian Kestler-D’Amours/IPS. 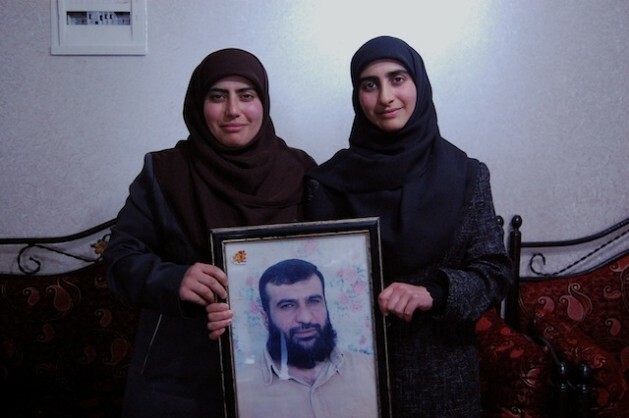 ABEYAT, Occupied West Bank, Apr 24 2013 (IPS) - Hind Ibrahim Abeyat has spent most of her life separated from her father. “Every house in Palestine has something – someone in prison, a martyr,” the 19-year-old told IPS from her family home in Abeyat village, near Bethlehem. Israel exiled Hind’s father, Ibrahim Abeyat, from the West Bank at the height of the Second Intifadah, after the Israeli army’s infamous siege of the Nativity Church in Bethlehem in 2002. At the time, Israel was carrying out a large-scale military operation in major Palestinian cities across the West Bank. In the midst of the Israeli assault on Bethlehem in April 2002, a group of Palestinian fighters and civilians took refuge in the Nativity Church, believed to be the birthplace of Jesus Christ, in the city centre. Some 200 Palestinians were trapped inside as Israel lay siege on the church for 39 days and fired live ammunition and other weapons at the building. After an American-brokered deal was reached to end the attack, Israel exiled 26 Palestinians hiding inside the church to the Gaza Strip, and another 13 to various European countries. “It was forbidden to look out the window, forbidden to go outside. We didn’t know what was happening,” said Doha, Hind’s 22-year-old older sister, explaining that the Israeli army surrounded the family home while her father, who is affiliated with Hamas, was in the church. "This is our homeland, our land. It is our right. The situation is very, very hard for me." After being flown to Cyprus, Ibrahim Abeyat was eventually deported to Italy, where he remains today. His wife spends six months of the year with him there, and the other six months with her children in the West Bank. For seven years, Hind and her seven siblings – now aged between 17-30 – could only speak to their father over the phone. They now talk to him daily over the Internet. “It’s very, very difficult. I don’t see my family,” Ibrahim Abeyat told IPS via Skype from Italy. “I want to go back to my homeland, and end these 11 years (in exile). This is our homeland, our land. It is our right. The situation is very, very hard for me,” Abeyat said. Between 1967-1992, Israel deported 1,522 Palestinians from the occupied Palestinian territories, according to Israeli human rights group Btselem. In 1992 alone, with the approval of the Israeli Supreme Court, Israel deported 415 Palestinian members of Hamas and Islamic Jihad to South Lebanon. Palestinians are deported under Israel’s Emergency Defence Regulations, which date back to 1945 during the British mandate of Palestine. The specific law for deportations – which was cancelled inside Israel yet remains in effect in the occupied territories – states that a military commander can force any person to leave and remain outside of Palestine. During the Second Intifadah, the Israeli Supreme Court also ruled that Israel has a right to issue “orders of assigned residence” to transfer Palestinians to the Gaza Strip. The court based its decision on Article 78 of the Fourth Geneva Convention, which states that an occupying power can subject people to assigned residence “for imperative reasons of security”. Article 49 of the Convention, however, outlaws deportations, and individual or mass forcible transfers, of people living under military occupation “regardless of their motive”. Israel has also forcibly relocated relatives of people accused of committing crimes against Israelis to the Gaza Strip, in violation of the Convention’s Article 33, which states that no person “may be punished for an offence he or she has not personally committed”. In late 2011, a deal was brokered between Israel and Hamas to release 1,027 Palestinian prisoners in exchange for a captive Israeli soldier. Of the Palestinians released, almost 200 were exiled to the Gaza Strip, and 41 were deported abroad. “Given the stark asymmetry in power between the occupied Palestinian and occupying Israeli parties involved, neither the potential ‘consent’ of the prisoner, nor the fact that these deals may have been negotiated by a Palestinian authority can serve as justification for the deportation,” stated Palestinian human rights group Al-Haq. In March, former prisoner Ayman Sharawna – who was first released from Israeli jail as part of the 2011 prisoner exchange, and then was re-arrested in January 2012 – was deported to Gaza after conducting an open-ended hunger strike for 261 days. “I felt sure that if I did not go, I would die. I was suffering, physically and psychologically,” the 37-year-old father of nine from Hebron, told the Gaza-based Palestinian Centre for Human Rights (PCHR). On Tuesday, Reuters reported that Palestinian prisoner Samer Issawi – who had been intermittently on hunger strike for over eight months – would finally end his protest and be released to his Jerusalem home next December. Issawi refused several Israeli attempts to deport him over the course of his hunger strike. “These strong positions never happened suddenly. People should sacrifice themselves and should fight (to reach) a new stage in their fight,” Murad Jadallah, a legal researcher at Palestinian prisoners’ rights group Addameer told IPS.